Say Aloha to our Travelocity Hawaii Gnome! The world-famous Roaming Gnome Travelocity mascot has become a legend, and this one has taken a trip to the tropics. This Hawaiian gnome is all ready to do the hula dance with his grass skirt and colorful flower lei. 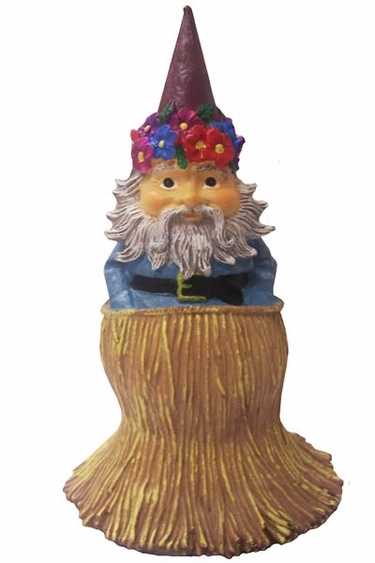 Our Hawaiian garden gnome is perfect for your next backyard luau, or to bring the spirit of beautiful Hawaii onto your patio, deck or lawn year round. Because he's made from weather-resistant cast resin, he can stand up to an environment that's not so tropical. These Hawaiian garden gnomes are 9.5 inches tall, which is a perfect size for a garden accent or to place by your front or back entrance. Size: 5.25" x 9.5" tall. Cast resin.